I have just been notified of another planning application for a Cafe/food outlet in Moreton, this one on Pasture Road at the site of the old VBM Soft Furnishing shop. I have yet to see the full plans but this application is described below. As more information becomes available I will post it here. I will also do a letter drop to the area notifying local residents of the application. 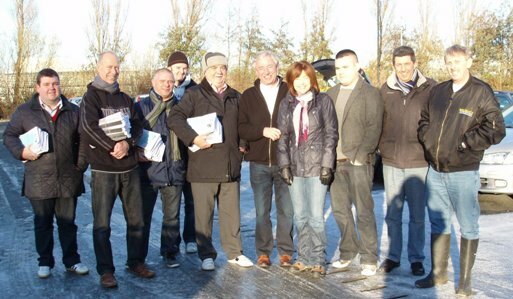 Earlier today, in crisp, icy but dry weather I met up with Steve Smith, and Cllr Ian Lewis and others, including the Leader of the Council, Jeff Green to help distribute the latest issue of Newsline to the good people of Moreton and Leasowe. We split up into pairs and spread ourselves far and wide across the ward to get the maximum spread, with me and Leah Fraser taking the long walk, Hoylake Road, Burnely Road and roads off (Don’t worry Don we left ‘Red Rose’ out) finishing in Chapelhill Road. It was a great couple of hours, lots of people chatting to us, all delighted with the Council’s consultation process, and the open and transparent way we are now doing business. Earlier today, along with Cllr Steve Williams I attended the first of many School Christmas Fairs. Today’s was at Lingham Primary School and was very well attended. There was a the usual stuff including Santa in his grotto. Sadly yet again I failed to win anything in the raffle, but amazingly neither did the king of the raffles Steve Williams! Next one is Foxfield on the 3rd December, followed by the fair at Christchurch on the 4th. Ho, ho, ho……..
Greggs Told to STOP Work! Readers of the blog and the wider community will be aware that Greggs submitted a planning application for a New Shop Front at 243 Hoylake Road (application 10/01258), which has an earliest decision date of the 2nd December, however the work is now nearing completion. I write with an explanation into the reasons why the shopfront at 243 Hoylake Road, application no above is nearly complete. 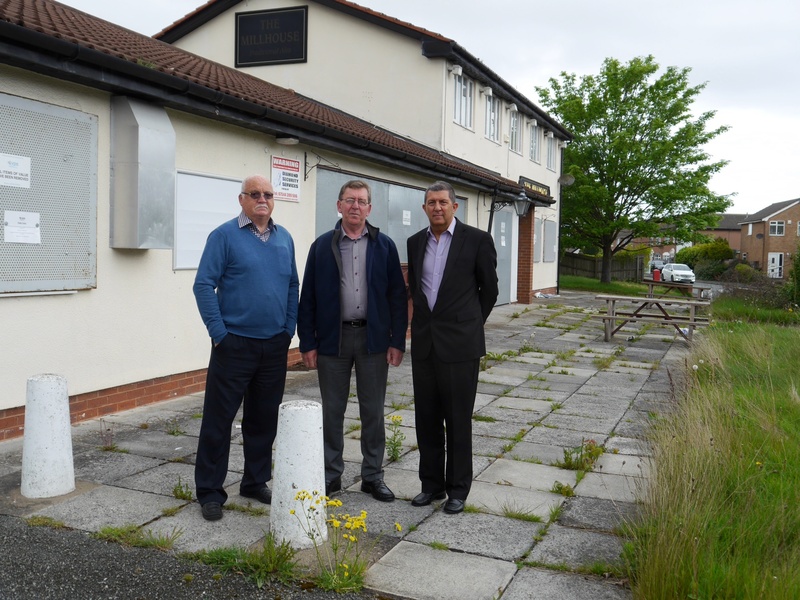 We received access to the property from the landlord earlier than what was originally anticipated and due to the scale of the work, it was decided to commence work. We understand that by doing this, we are taking a risk. However, following discussions with yourself, my understanding was that there were no preliminary objections with the proposed shopfront as it would be enhancing street scene due to the existing shopfront being of a poor state of repair and design. Also, the staffing is in place, creating employment in the local area during the current economic climate. I find it absolutely incredible and quite disturbing that Greggs are prepared to insinuate that the blame for the work going ahead is the responsibility of Wirral’s planning Officers, Just how low will they stoop? Further to your email regarding the works commenced on site prior to the grant of planning permission, I would like to clarify that at no point has the local planning authority encouraged you to proceed with the proposed works. Only today was I asked if I had any objections to the principle of a new shop front in this location, at which point the works were already well under way. I would advise that you cease all works on site until the application has been determined. If you decide to continue with the works regardless then you must be aware that you do so at your own risk. I believe Greggs actions in just plowing ahead with the work, without any regard for the people of Moreton and local businesses is indicative of a company that may just be driven by profit, without any concern for community. I have now removed the application from delegated authority in order that the planning committee will ultimately make the decision, I hope that a clear message is given to Greggs by Wirral’s Planning Committee. It seems that companies who submit planning applications are not even bothering to wait for Wirral to say ‘Yes’ or ‘No’ to the application they just carry on regardless of planning laws. The latest applicant to do this is the agent acting for Greggs the Bakers, who have applied for a new shop front on Hoylake Road (where the former Barometer clothes shop was). The earliest the application could be determined is the 2nd December, thats if its done under delegated authority. However the work to the shop front looks to be almost complete. I have now removed the application from delegated authority in order that the planning committee will ultimately make the decision, I have also asked the planning officer to find out why the applicant has behaved in such an unacceptable manner? Yesterday, along with Cabinet member colleague, Cllr Gill Gardiner I attended the launch of the ‘No Cold Calling’ initiative at Brookdale Close and Whitelands Meadow in Greasby. The scheme is designed for tenants, both in social housing and in private home ownership as a deterrent from high pressure sales, and basically makes an area a, ‘No Go Zone’ for cold callers. 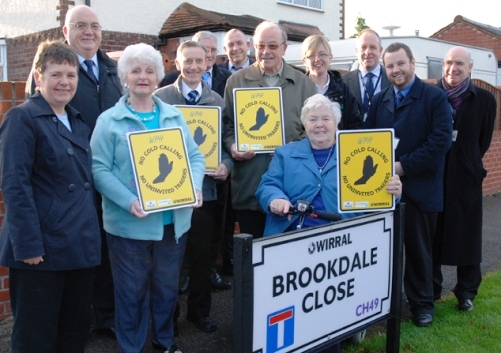 The Brookdale Close initiative , is a new joint venture with Wirral Partnership Homes and is aimed at protecting their tenants from high pressure selling of products such as burglar alarm systems and mobility aids. 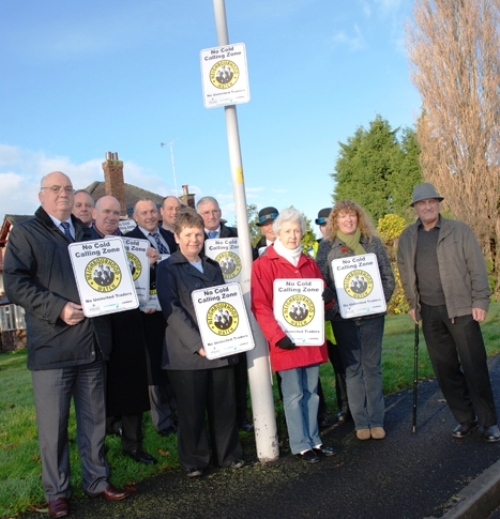 Whilst Whitelands Meadow is a more traditional no cold calling zone aimed at owner occupiers. As the Cabinet Member responsible for community safety I am delighted that initiatives such as this, which cost a relatively small amount can bring reassurance to local people.